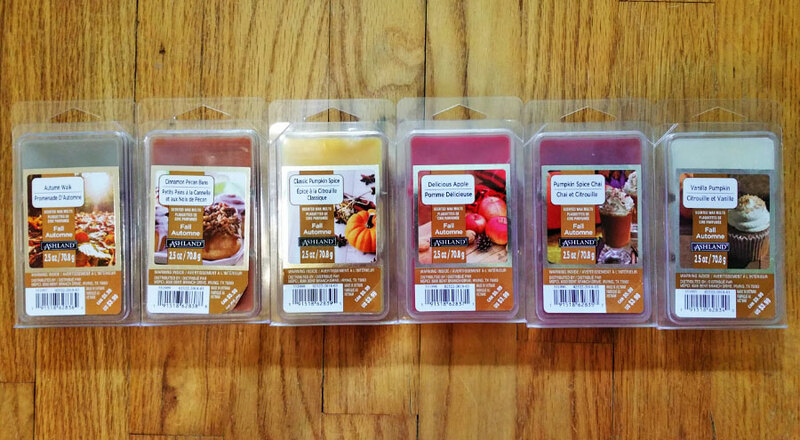 This is a review of Michaels (Ashland) Fall Wax Melts Reviews from 2018. As of this Fall collection, Hanna's Candle is no longer making the Michaels (Ashland) wax melts. I don't know who the new manufacturer is. I smell men's cologne, sandalwood, and a fresh air note. It's the same as Autumn Walk from July 2017. I said last year that the cologne note was a bit harsh. Actually, I think it has a very slight sour note, or maybe a smidgen of that old apple note, or old wood, way in the background, and that's what I don't care for. Someone made a mistake at the factory, because this is the same scent as the Classic Pumpkin Spice scent. Just like the scent name says, this is a standard pumpkin pie type scent. A little generic, nothing exciting. It's apple. I don't think I detect any spices. It smells nice even though it's a fake apple scent, like apple potpourri. Melted, I detect a hint of caramel. This smells a little like apple cider with a sweet raisin note. I do smell nutmeg, which gives it a pumpkiny note. I don't smell any tea or chai notes though. I don't know if it's the same as Pumpkin Spice Chai from July 2017, since I described that as a sweet pumpkin pie scent with a hint of chai tea. When melted, I don't really smell the apple note that I smell on cold sniff, and it smells more pumpkiny. On cold sniff smells like a sweet creamy milky vanilla scent with coffee and a hint of nutmeg and cinnamon. It's a really nice scent, my favorite of this collection. Melted though, I smell more of the pumpkin spices and much less of the coffee. It's still a nice scent though.